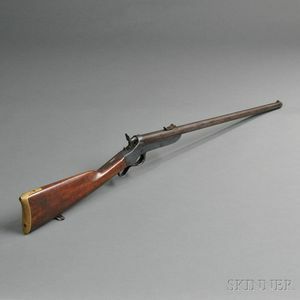 Sharps & Hankins Army Model 1862 Carbine, c. 1862-65, walnut stock with brass buttplate, steel frame marked on right side SHARPS/&/HANKINS/PHILADA, and on left side SHARPS/PATENT/1859, serial number on frame tang 1986, barrel lg. 24, overall lg. 38 3/4 in. Walnut stock has some light dings, frame retains some color, and barrel is a light plum color.